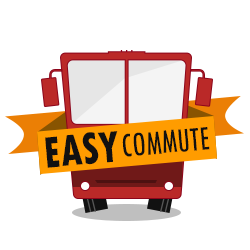 EasyCommute - Affordable Bus Shuttle Service. EasyCommute is a Mobile based Intracity AC Bus Shuttle Service with Confirmed Seat, Free High-speed Wifi (4G), GPS-based Live Tracking starting from 15/-Rs (cheaper than any other transportation) aimed at making your daily commute easy and convenient with a hassle free experience. Once you are happy with your rides you can refer your friend. For each referral you will earn 1 extra free ride once he/she register using your referral code. - AC Buses - Beat the heat! - CASHLESS - Pay from e-wallet, No need to keep changes!